Blackknight is a piece of software for logging and evaluating HEMA round‐robin tournaments which are conducted according to the HALAG rules, particularly according to the exegesis by Tremonia Fechten. Blackknight is meant for, but not restricted to HEMA tournaments. This tournament mode is, in principle, suited for any martial art. If you want to run a competition with a complete ranking based directly on the contestants’ performance data, try Blackknight. No seeding, no point distribution, no false assumptions. Enjoy tournaments which are unaffected by arbitrary factors. You can focus on fighting in the context of your art while Blackknight takes care of the maths involved. The program is written in C♯, it’s free of charge, and it runs under Windows 7 or later. Blackknight is gradually improved and expanded as required. So far, Blackknight speaks English and German. Generate a list of the contestants. Fill in the contestants’ names. 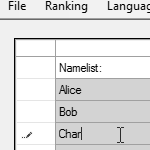 Double‐click the cell in the column with your name to enter your and your opponent’s states. Done? Have Blackknight evaluate the tournament. 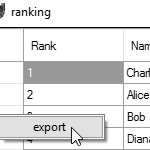 Right‐click to export the results. Blackknight is meant to log and evaluate round‐robin tournaments which are fought according to various versions of the HALAG rules. However, it’s probably suited for other round‐robin tournaments, too. If you don’t know them yet, you might want to learn about the HALAG rules first. After each match, the contestants can be considered either dead, injured or unharmed. Blackknight computes useful statistics and a ranking based on these statistics. If you want to know why we prefer this competition mode to the more common combination of repeated fights and elimination mode, read our corresponding article on Hroarr.com (PDF). How much does Blackknight cost? Nothing. Blackknight is and will remain free of charge. Is there a manual for Blackknight? There will be a manual. Meanwhile, maybe the screenshots can help you. How does Blackknight compute the ranking? 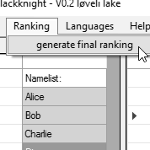 Blackknight determines the ranking according to the contestant’s performance data. The most important criterion is the empirical probability of getting killed. The less you die, the better. 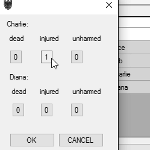 If two or more contestants share the same probability of getting killed, these fencers will be sorted according to the probability of surviving injured. Again, the rarer, the better. The next criterion is the empirical probability of killing the opponent. And the last criterion is the probability of injuring the opponent. But this priority order doesn’t reflect the context of my art. We know that there are different contexts which may require different priorities. 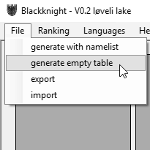 You can now manually sort the results the way you want them with Blackknight, and we intend to add several sensible presets in a future release in order to reflect different contexts in which your fight may take place. Feel free to contact us and suggest a preset! Will Blackknight support elimination tournaments, too? Not really, no. The elimination system is very easy to evaluate, so there won’t be much benefit from using a computer. Additionally, the results from an elimination tournament are not particularly significant. However, as an elimination tournament is a subset of a round‐robin tournament, you can enter an elimination tournament as an incomplete round‐robin tournament. We really don’t recommend elimination tournaments, though. What’s wrong with elimination tournaments? Elimination tournaments are based on the strong assumption of transitive defeat. That means, if fencer A defeats fencer B, and fencer B defeats fencer C, then A would also beat C. Reality, however, does not support this assumption in general. Additionally, only the nominal winner is known after an elimination tournament, while the ranking of the other contestants remains a mystery. Getting nothing more than a nominal winner, based on a too strong assumption, is not an efficient use of the effort and time that are put in organisation and training. A round‐robin tournament on the other hand allows Blackknight to create an accurate ranking in which every single fight counts. Blackknight sheds a bright (or even harsh) light on the contestants’ fencing skills and thus helps you organise an exciting tournament. Does Blackknight require an active internet connection? No, Blackknight is fully functional when used offline. We don’t force you to share your tournament data. Can I evaluate this tournament mode without a computer? Yes, you can. Though it might take a bit longer and you risk to miscalculate. We will be happy if you try Blackknight in your competitions and share your experience with us. Should you have any suggestions, send a mail to blackknight@tremonia-fechten.de. However, we would like you to understand that Blackknight is a project we pursue in our leisure time and we don’t earn any money with it, so we cannot promise that we implement or reply to your suggestions. Robert Geißler of Tremonia Fechten developed the statistical tournament evaluation and devised Blackknight. Tobias Kürschner has been writing Blackknight. Christian Jung of Tremonia Fechten came up with the name for it. Marcus Hampel of Anno 1838 and Tobias Wenzel made the HALAG rules for Hammaborg.